We went to Abu Dhabi last week as did many of the world’s best golfers. And as it happens, we were lucky enough to exchange a few words with a very happy winner who had a strikingly wide grin on his face. No doubt that Frenchman Gary Stal was feeling like the luckiest man in the world yesterday after storming past Martin Kaymer in what was the most dramatic finish that the 10-year history of Abu Dhabi HSBC Golf Championship has seen. But this time I am referring to an Englishman called Iain Parker. Never heard of him? No wonder. You probably hadn’t heard much about Stal – 357th on the world ranking – either. And for both of these gentlemen the past weekend turned out to be the most memorable of their golfing careers so far. Mr. Iain Parker, an 11-handicapper and a long-term GameBook user from the UK was without a doubt the other big winner in Abu Dhabi. Iain used GameBook on the golf course around Christmas time, participated in our Avenue to Abu Dhabi HSBC Golf Championship contest and ended up becoming the grand prize winner. This meant no less than a once in a lifetime trip to Abu Dhabi for him and a friend of his choice – including VIP passes to the event and a round of golf with the young star player Matteo Manassero in the official Pro-Am. Sure sounds tempting. But how was it in reality? Let’s find out. 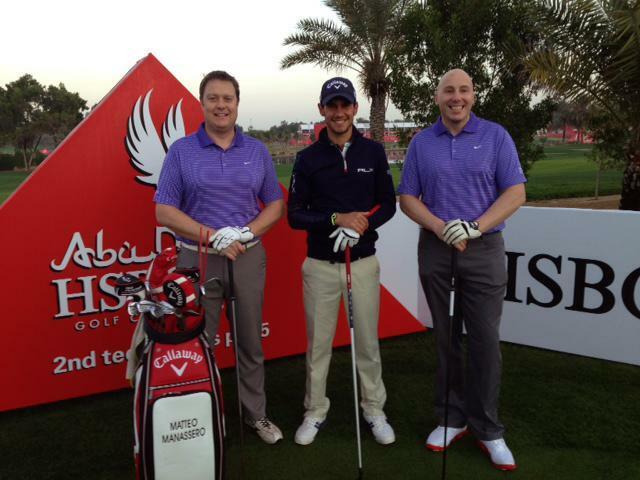 Iain Parker (on the left) and his Friend Chris Wilson (on the right) got to spend one of the most memorable days of their golfing careers with Matteo Manassero (in the middle) at the Abu Dhabi HSBC Golf Championship Pro-Am. GameBook: Can you describe, in your own words, how you came to be here? Iain Parker: I have been using GameBook with my friends for a couple of years now. I was looking for an app that would allow us to compete and follow all the scores on the course for the 8-10 people that play golf regularly together. Since then I have always scored via the app and recently I noticed that GameBook were running a competition to play with Matteo in Abu Dhabi. It was simple to enter, as you only had to answer one question at the end of the round you had played. Luckily I played a few rounds during the time so had a chance to enter more than once, although I never thought I would win. GB: How did you feel when you found out you’d won? IP: I received an email informing me that I was the winner of the competition. I read the email on my phone when I had returned home and didn’t believe what I was reading. I read the email word for word three times, whilst reading the third time my wife was asking me what it was about. I had to ask her to wait a couple of minutes, as I didn’t believe what I was reading. Once the penny had dropped I was blown away that I had won this prize, which there is no doubt is a chance of a lifetime trip. GB: How would you describe your experience as a whole? IP: Since the moment that we arrived we had such a fantastic time. Almost within 24 hours from leaving home we were on the first tee of the Pro-Am with Matteo and since then it was non stop. GB: What was it like to play with a European Tour star? IP: Since watching Matteo on the TV at The Open in 2009 and seeing him play again and again over the last few years I was over the moon that I was going to get the chance to play with a player of his ability. Walking up to the first tee all that was going through my head was ‘I hope I play ok’. Whilst it was my big day I was very conscious that it was the day before the real work started for Matteo. But that didn’t show in any way as the whole team that joined us on the first tee were so welcoming. Matteo, Dave McNeilly (Matteo’s Caddy), Roberto (Matteo’s Father) and Alberto (Matteo’s coach) were all very friendly. Between shots on every hole I was chatting with one or more of them and receiving either positive encouragement or a ‘well done’ for the shot I had just hit (unfortunately more of the former than the latter, but that’s golf). GB: How was Matteo like as a person? IP: Matteo was really approachable and great company. He had not been having the best of time off the tee, but he never let that stop himself from talking to the amateurs he was playing with and always encouraged and supported us through our rounds. He happily answered all our questions whether it was about him and his golf or his life off the golf course and his family. Dave (Matteo’s Caddy) was also a great character and I had some great conversations with him about golf and my other love, Rugby. GB: Are there any specific highlights from the Pro-Am round you could pick out? IP: My round was a mixed bag, however hitting all four par 3’s was a great achievement and once I got my driver working towards the end of the round I was able to start scoring. Overall the experience of playing a round on a course setup at championship level with a Pro of Matteo’s calibre will be one that lives with me for the rest of my life. Matteo will have me following him as an avid fan for the rest of my life!